I am working on material system in my renderer recently. 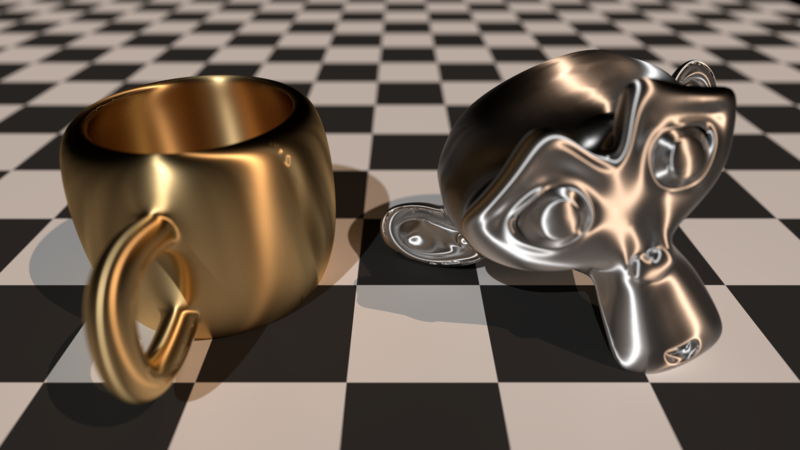 My old implementation of microfacet models is all isotropic BRDF, as a result of which, I can’t render something like brushed metals in my renderer. After spending three days in my spare time to extend the system to support anisotropic microfacet BRDF, I easily noticed how much mathematics that it needs to understand all the importance sampling method. The fact that and are somewhat correlated makes the importance sampling a lot more complex than isotropic model. For a detailed derivation of isotropic microfacet importance sampling, please check out my previous blog. I strongly suggest checking it out if the math formula in this blog confuses you because there are a lot of basics that I won’t mention in this blog. It is gonna be very boring to go through the whole blog. In case you are already bored, here is what you can achieve with the BRDF model. Hopefully, this image can convince you finish reading it. Since this is a joint density probability function of and , we need to take one sample based on the marginal density probability function first and then take the second sample based on the conditional density function. Let’s take a look at the CDF for first. Since we are not integrating , I’d like to define a helper term to make the whole derivation shorter. Before we dive into the derivation of , there is one minor situation to handle. Because arctan only gives you ranges between and , we need to remap some value to get the full range between 0 and . Above is a graph that I generated, since our random value goes from 0 to 1, we are only interested in ranges between 0 and 1. The factor doesn’t affect the cycle of this function, it only affects the curve shape. It is fine to sample negative values here since doesn’t always need to be positive, it can be anything as long as it covers the whole range. However, one thing that we can easily notice is that the result goes from and and there is even a remap once the random value is larger than 0.5. My solution is to offset each section by an offset. Extra special attention needed here to make sure the value is correctly taken in the rare case where the random value happens to be 0.25 or 0.75 so that the final curve is a continuous one. And the can be totally ignored since it is the cycle of cos and sin, which is our only usage for . However, I’d like to add it here just to keep the result in the range of [0, ]. Several concepts are very similar to the above derivation, which we will skip here for simplicity. One minor detail to notice is that since we can’t really approach 90 degree angle for , we will not take it into consideration here. Surprisingly, this is exactly the same with GGX’s marginal probability density function, so we will take everything we have derived here to avoid the duplicated work so that we can move forward to the CDF for directly. And again, we can also flip the because it goes from 0 to 1. Importance sampling is always importance for a ray tracer. With the above method, a ray tracer should be able to reach relative noise-free image with reasonalely enough sample taken per pixel. There is also some future work improving the efficiency of importance sampling for the microfacet model, like sampling visible normal. And it is also the default method for PBRT microfacet model sampling. Last, not least, if someone is interested in the detailed implementation, they can check it out in my github project here .